Longbox Graveyard guest blogger supreme Mark Ginocchio of Chasing Amazing returns this week with a personal column about how a man without a cape may be the greatest super hero of all! Welcome back, Mark! The comic book world is filled with superheroes with fantastic powers who make the impossible seem possible. But what this universe seems to be lacking is working class stiffs who still find a way to be extraordinary despite not having the ability to fly, shoot lasers from their eyes or leap tall buildings in a single bound. As many of you should know by now, Spider-Man is my superhero of choice. What you probably don’t realize is that of all the Marvel Universe’s characters, Daily Bugle reporter Ben Urich is my ACTUAL hero. First introduced by Roger McKenzie and Gene Colan in Daredevil #153, Urich is the Daily Bugle’s “ace” reporter. 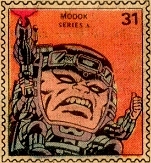 The character was elevated to iconic status via the pen of Frank Miller during his epic run on Ol’ Hornhead. 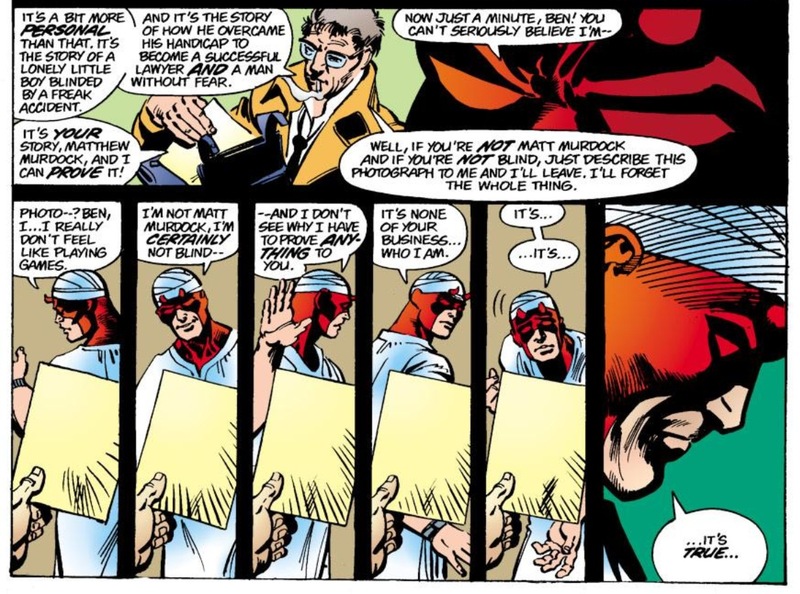 During Miller’s run, Urich’s dogged reporting skills outed blind attorney Matt Murdock as Daredevil (though Urich would keep this information under wraps as a means to protect the hero). He then used his connections to Matt to get information that would help take down Wilson Fisk, aka, the “Kingpin” of crime, via the power of the press. In later stories written by different creators, Urich would take down other businessmen-turned-costumed-criminals, like Norman Osborn (aka the Green Goblin). 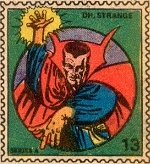 Urich often tap-danced on the lines of morality in terms of how he obtained information for his stories. But there was always an “ends justify the means” rationale to Urich’s work. If he successfully exposed true evil and villainy like Kingpin and Osborn, what difference did it make if he canoodled with unhappy gang members, or extorted the likes of Daredevil and Spider-Man for info? So how could I possibly identify with this middle-aged, chain smoking newspaper reporter? For the first part of my professional life, Urich’s was the lifestyle I aspired to achieve. Ever since I was in high school, I had dreamt of being a newspaper reporter. I knew print journalism wasn’t a field where I would make a lot of money or become a famous celebrity, but I didn’t care. The idea of investigating a story – interviewing sources and putting all these ideas together like it was an 1,000-piece puzzle – was the most exciting career choice I could imagine. In college, I interned at Newsday in Long Island, NY, at the time, one of the largest newspapers in the country. I mostly covered local business stories but one day, my editor sent me out assignment to a private marina where a Fortune 500 CEO was rumored to be selling his yacht because of his company’s poor financial performance. “Just talk to some guys at the marina and see what they’ll tell you about the CEO and the boat,” my editor told me. It was the epitome of a BS assignment. I probably wouldn’t even get access to the marina and if I did, nobody was going to talk to some 19-year-old with a press badge. Through a little smooth talk and perhaps some omission of truth, I gained access to the marina (I told them I was interested in writing about the boat, without mentioning the CEO). Then I managed to find a dock worker who was extra chatty who not only told me about the CEO’s wild yacht parties and weekly boat races with other millionaires, he asked me if I wanted to ride ON THE BOAT. When I went back to the newsroom with quotes, color and pictures, my editor nearly keeled over in disbelief. After graduating from college, I worked at a daily newspaper in Stamford, CT, for five years. I covered everything: obituaries, transportation issues, congressional politics and high finance. But the industry was changing. Print was on the decline. Newspapers were consolidating operations or going out of business all together. My paper was sold to a new media conglomerate that owned two others newspapers in the state. I left the industry and took a new job in corporate communications at a firm in New York City. These are the kinds of jobs hardened journalists dubbed “the dark side.” On my last day in the newsroom, my editor gave me a t-shirt that said: -30- … the short hand signifying the “end” of a news story. She told me that one day she hoped I returned to newspapers, but she doubt I would ever be that stupid. I thought I was a true “newspaper man” but maybe I wasn’t. Maybe I was just a quitter who got drunk on the excitement, but couldn’t take the heartache and often isolation that comes with being a reporter. Urich is a true newspaperman. While the media has long played an important role in the Marvel universe, Urich is the guy I wish I had the stomach to become. J. Jonah Jameson, editor-in-chief, later publisher of the Bugle, was more comic relief (though he had a few moments that made me proud he flew the journalism flag). Joe Robbie Robertson was one of the nicest guys around, but he was an editor. He rarely got his hands dirty digging into a story. He managed the slobs and the jerks who would do anything to break news. 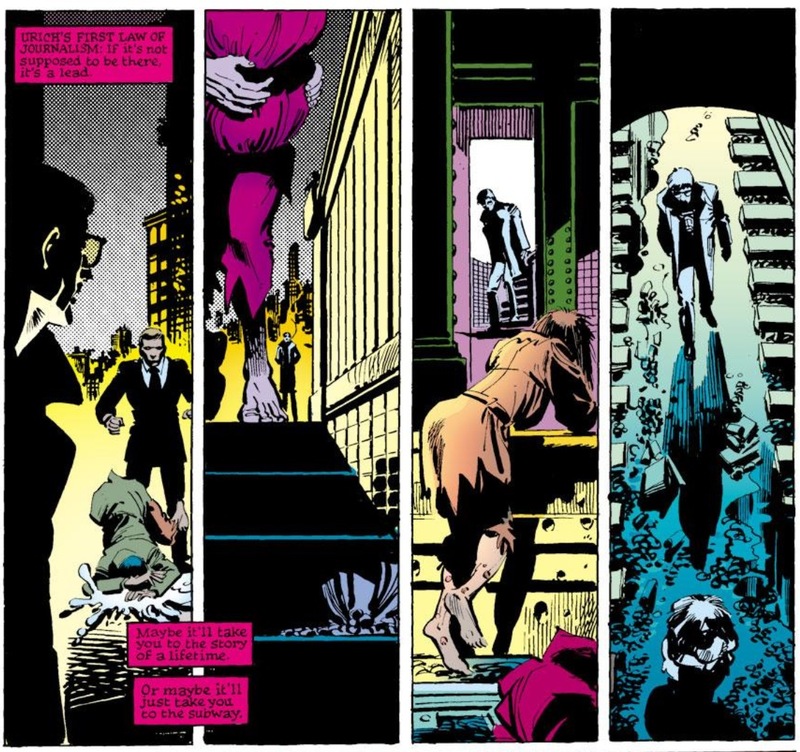 Regardless of his methods, Urich’s principled stand against Fisk and Osborn took real courage. These were some of the Marvel universe’s most powerful and violent individuals, who could easily snuff Urich out like the end of one of his token cigarettes. But Urich soldiered on because for him, reporting was all he had. It made him feel alive, just like I still get that rush any time I get an opportunity to put on my old reporter’s hat again. 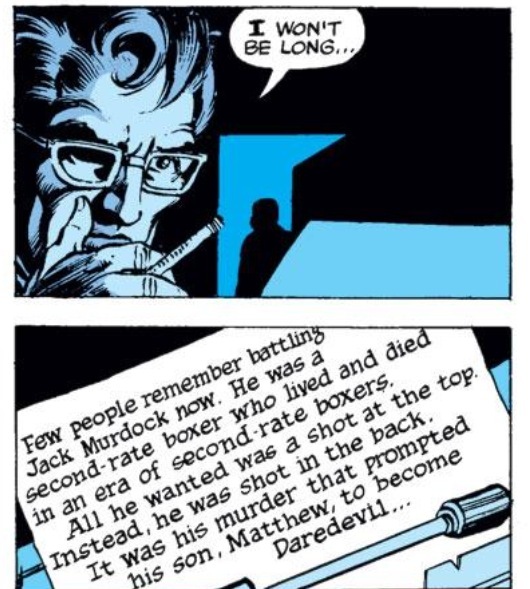 While Miller’s run on Daredevil is filled with memorable issues, my all-time favorite is Daredevil #179, which is narrated by Urich, and dubbed “my story.” The issue starts with Urich meeting an informant in a darkened movie theater regarding the New York City mayoral candidate Randolph Cherryh and his connections to Kingpin. 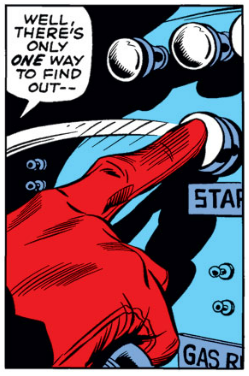 The informant is then killed via an Elektra sai through the back (and through the theater seat). Urich is warned to stay away from Cherryh. The whole issue reads like a love song to the world of blue-collared shoe-leather reporting. Urich’s narrative reminded me of the time I was in high school and I went to a lecture being given by legendary reporter Jimmy Breslin, who told us, “the best stories involve climbing stairs and waiting in the rain to get them.” I.e., nothing newsworthy ever happens on the first floor of a building on a sunny day. Maybe that was Urich’s third rule of journalism? Of course, this being a Frank Miller comic, Daredevil #179 ends with a swift kick to the family jewels if you’re a Urich fan. 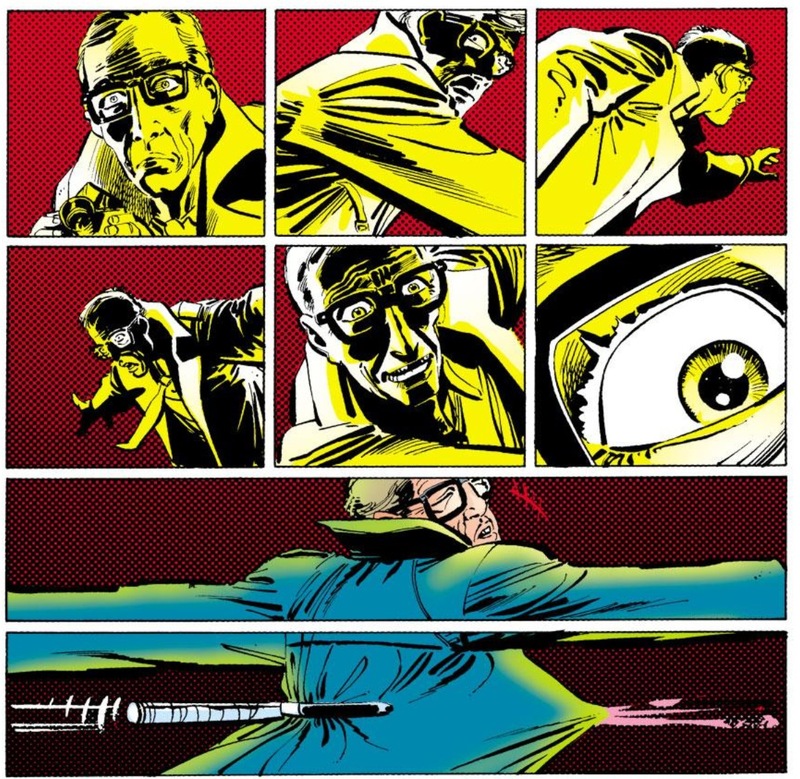 While secretly taking photos of a fight between Daredevil and Elektra, Urich coughs – foreshadowed earlier in the comic with all of his smoking (it’s a bad habit, Urich said). The cough earns Urich a sai through a side. The first time I read this comic, I frantically jumped to the next issue in my trade paperback because I didn’t know if Miller had the stones to kill off Urich (it’s not like he couldn’t have been resurrected at a later date). Fortunately Urich lives, and he’s ready to withdraw his hunt to take down Cherryh. “After everything I’ve been through …” he tells Matt. But even in defeat, Urich unknowingly has an ace up his sleeve. A photo of a bag lady – one of those “not supposed to be there” people he had referred to earlier – turns out to be the presumed deceased wife of Kingpin. Daredevil is able to use this information for leverage to get Fisk to withdraw Cherryh from the mayoral race. I think my biggest disappointment during my time at the newspaper was the fact that I never had that one, game-changing story to hang my hat on. I had memorable experiences, and had the pleasure to talk to many fascinating people, both famous and otherwise. But I never took down the Kingpin of crime, or was threatened with a sai (though I was thrown out of a book signing by Don Imus for “standing too close” to him). And the good news is, Urich is still alive and kicking in the Marvel universe, breaking stories and making a difference. After I’m done reading about my favorite superheroes, I can turn to a real-life hero as well. Thanks, Mark, for the thoughtful insight on this most extraordinary “ordinary” man! Remember to visit Mark at his home on the web —Chasing Amazing — where Mark chronicles his pursuit of every single issue of Amazing Spider-Man! IN TWO WEEKS: #114 Vengeance of the Molecule Man! Posted on October 9, 2013, in Conspectus and tagged Ben Urich, Daily Bugle, Daredevil, Frank Miller, Klaus Jansen, Netflix. Bookmark the permalink. 22 Comments. I enjoyed this immensely, Mark. One of my very favorite things I’ve read of yours. I was always smitten by the idea of becoming a reporter myself when I was a teen. My life took a different direction, but like you I’ve always found characters like Urich among my favorite in fiction. Thanks again Tyler. 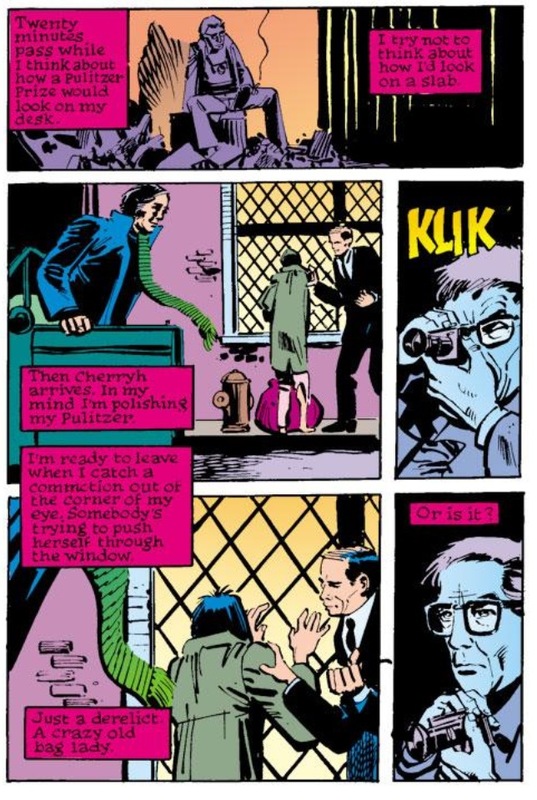 A reporter’s life was just about as glamorous as Urich made it seem, which is probably why I identify with him so much. Nothing better than cracking a mystery and getting an amazing story out of it, but sometimes you just get a sai in the back..l (figuratively speaking). Urich is one of my all time favorites. I always thought he could anchor his own series kind like Marvel’s Alias, but as a reporter investigating stories and crimes rather than a detective. Terrific piece on Urich. I really enjoyed reading this one. I am generally more of a DC fanboy than a Marvel zombie, but one of the strengths of the Marvel U is the true shared universe nature of it. 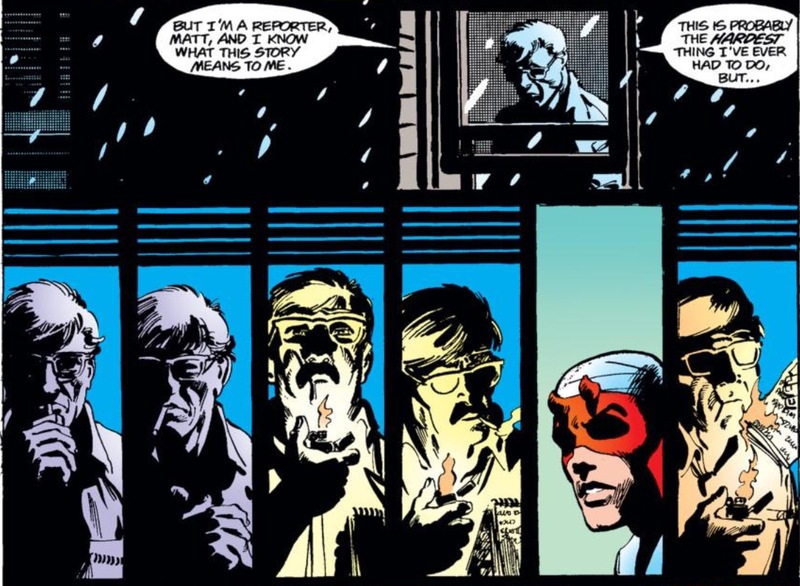 I love that a character like Urich can seamlessly move between Spider-Man and Daredevil and wherever else the Bugle reaches, because they are all in the same city. Plus the DC reporters — while certainly earnest — are just a little harder to believe than Mr. Urich. 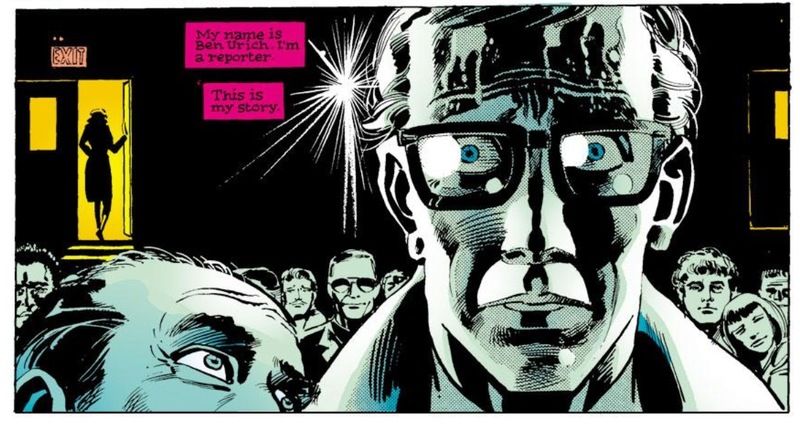 Urich on the verge of death is one of the most tense moments I read in any graphic novel. I liked that character too, though this was the one and only story I ever read! I don’t recognize that one. Was it a Spidey? Daredevil.